Rise Above is a self-help book based on the teachings of A Course in Miracles, which has the aim of helping the reader rise above the problems and challenges of everyday life. The author shows how certain A Course in Miracles Workbook Lessons can be used regularly to help overcome problems such as anger, guilt, resentment, a lack of forgiveness, the fear of ill health and death, anxiety about the future, feeling trapped in the world of the ego, low self-esteem, the mistrust of others, and much more. Making use of the wisdom of A Course in Miracles, Raveena Nash offers practical advice and guidance to help the spiritual seeker make progress along the Path of Forgiveness. Rise Above is the perfect self-help book to carry around and dip into whenever something challenging crops up. 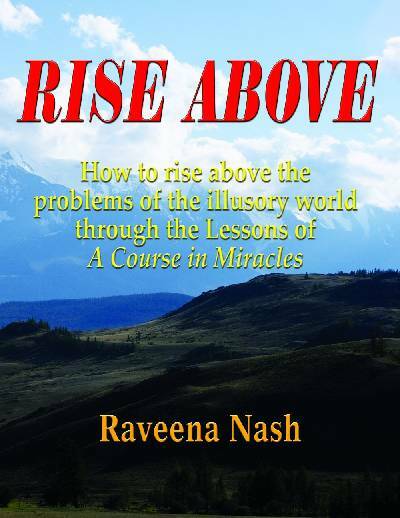 Following on from It's All An Illusion!, Raveena Nash's first book, Rise Above focuses on the practice of A Course in Miracles through the use of the Workbook lessons. It will help the reader acquire greater understanding of the Course, and show how one's perceptions of the illusory world can be changed, as one rises above the world of the ego and embraces the truth.